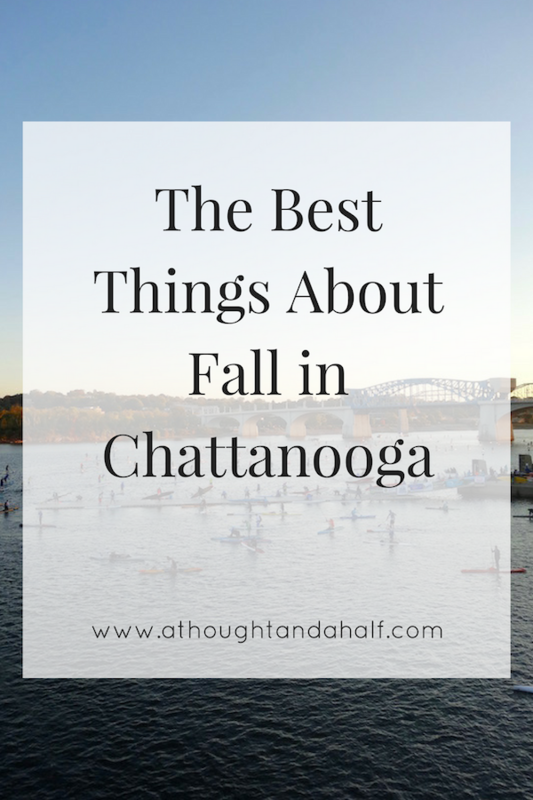 The Best Things About Fall in Chattanooga + GIVEAWAY! Y’all, fall is almost here, and I’m so excited. I talk a big game about how much I love summer, but if I’m pushed a bit, fall is probably my favorite season. I love my boots, leggings and scarves too much to say otherwise. It’s cool enough for my switch from iced to hot lattes, and it’s football season, of course. Plus, there is so much to love about the fall in Chattanooga. From the leaves changing colors on the mountains to all the fun seasonal events, fall is a happening season in Chattanooga. The weather is perfect for outdoor events and activities. The fall foods and flavors can’t be beat, and my favorite restaurants in town always deliver some really delicious eats during the fall. I’ve written before about some of the best things about fall in general, but this time, let’s talk about fall in Chattanooga specifically. There are so many reasons I love the fall in Chattanooga. I’m already obnoxiously excited for all of this. Foliage colors on the mountains // I love our mountains year round, but they’re twice as pretty once the leaves start changing colors. Driving to work in the mornings and home in the evenings is like driving through a painting. 3 Sisters Bluegrass Festival // If toe-tapping bluegrass music is your thing, then 3 Sisters festival needs to be on your calendar. I didn’t make it to 3 Sisters last year, so I’d love to check it out this year. The 2017 lineup features the Del McCoury Band, Sam Bush, Molly Tuttle, Bryan Sutton and several other really great acts. The best part? It’s FREE! Oktoberfest // Whether you’re embracing your German heritage or want a new cultural experience, check out any of the Oktoberfest celebrations in town this fall. The Chattanooga Market has a big one about mid-October, and Rock City’s annual “Rocktoberfest” happens all October long. Be sure to check out some local Oktoberfest beers, too; Chattanooga Brewing Company’s happens to be my favorite. Startup Week // Chattanooga’s got a great innovation, startup and small business community, and we celebrate it each year with Startup Week! Throughout the week, business owners, entrepreneurs and anyone involved in the innovation community give talks, lead seminars and host all kinds of special events to help grow small business in Chattanooga. It’s one of my favorite weeks of the year because I always learn so much. Last year was especially fun, because I got to be a judge in the first-ever Pop-Up Restaurant Challenge. Apple picking // This is one of my all-time favorite fall activities, and a super fun fall date idea! There are several pick-your-own orchards in North Georgia (about an hour’s drive from Chattanooga), and many other orchards that sell their apples by the bushel or peck. Last year I stocked up on fresh-picked apples at the farmers market and made a ton of apple butter and apple sauce. Farmers market // I go to the market pretty often in the spring and summer, but it takes on a whole new feeling and sense of fun when fall comes around. There’s the Cast Iron Cook-Off, chili competition, Culture Fest and so many more special events… not to mention the Oktoberfest celebration! Handcrafted Wishes 2017 // One of the best, most fun food and drink events is back at the Hunter Museum this October! I went to this awesome event last year and I can’t wait to go back again next month. Handcrafted Wishes (put on by Hand Family Companies) is a food and drink benefit event that features food from some of the best local restaurants and beers from Hand Family Companies’ distribution network. Last year’s event sold out quickly and I expect this year’s to do the same. Wine Over Water // It’s the 23rd year for one of Chattanooga’s best events! Wine Over Water brings more than 100 wines to the Walnut Street bridge, along with food from popular local restaurants (including Easy Bistro, 2 Sons Kitchen, The Daily Ration and more). Proceeds benefit Cornerstones, Chattanooga’s only non-profit historic preservation organization. This year, there will also be several “off the bridge” events to extend the fun beyond the main event on that Saturday. Check out the Wine Over Water website and Facebook page for more info on what’s happening. Outdoor events & festivals in general // As I said earlier, I love the summer and being outside, but it’s just so much more pleasant in the fall. Between 3 Sisters, Wine Over Water, Handcrafted Wishes and any number of other great events, there are plenty of opportunities to get outside and enjoy the fall in Chattanooga. Eating dinner outside // It’s not like I can’t do this at other times in the year (except the winter)… it’s just much more pleasant in the fall. Digging into a warm bowl of pasta or soup on a patio, or enjoying coffee or tea outside before work, when the weather isn’t stifling hot or humid, just sounds marvelous. Watching the sun rise over the river // I used to get really sad when it starts getting lighter later and darker earlier, but I’ve changed my mind a little bit. There’s something really calming and grounding about taking a walk over the Walnut Street pedestrian bridge, right as the sun comes up over the River, and watching the daylight hit. Since I’m so excited about fall and all the awesome events coming up, I’ve got a special giveaway! And not just any giveaway… I’m giving away one general-admission ticket to this year’s Wine Over Water festival on Saturday, October 7! You have until SUNDAY 9/24 at MIDNIGHT to enter. Winner will be selected and contacted by October 1. So, get on it — all you have to do is comment below and tell me what you’re most excited about this fall! And since I love y’all so much… stay tuned to my Facebook page for something else special coming y’alls way soon!